← It’s amateur night. Take ‘er easy folks. Butter me up, Ina! I’ve got a yen for chocolate cake. 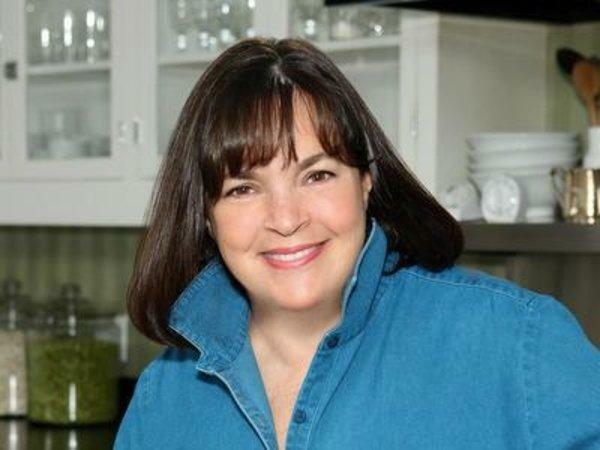 People swear by the Barefoot Contessa, but I don’t agree. It’s not just that her bangs bug me, though they most certainly do, or even that I get so preoccupied with the desire to flip her collar back down where it belongs that I can’t focus on the food. What really gets up my nose is the not-so-subtle nagging quality to Ina’s recipes: use extra large eggs, finest quality chocolate, freshly brewed hot coffee. I mean really – once a cup of coffee has been baked into a cake, who could possibly tell the difference between a freshly brewed cup and one that’s been sitting around on the counter for an hour? I’ll tell you who. Nobody. Then there are the oven temps where the Fahrenheit is always indicated, as in “350 degrees F.” Now there’s an important safety tip, Egon. You don’t want to take a chance that people will think they should set their ovens to 350 Celsius, which if memory serves is approximately the surface temperature of Mercury. But of course, our Contessa spends so much time on the Continent that one understands her need to clarify. Busy-bodying and Euro-pretention aside, however, the thing that pushes me over the edge is the butter. As far as I can tell, Mrs. Garten takes any given recipe and automatically doubles up on the butter. Now don’t get me wrong, I like butter as much as the next fat-assed, middle-aged trailer park cutie, but Ina goes too far, even for me and my ilk. For example, her recipe for butter cream frosting calls for two sticks of butter, which is way, way, WAY too much. 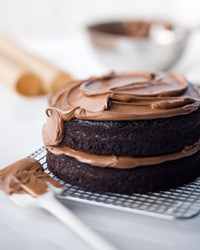 Follow this recipe and you’ll end up with something that’s better suited for a lube job than a layer cake, and which, rather than being sinfully delicious, is just plain greasy. By the way, have you seen this? Deep fried butter from the Midwest. I thought I’d seen it all when Nigella fried a Mars bar and Paula fried cheesecake. No siree. Apparently this is a local delicacy – like crickets in Southest Asia, or live octopus in Korea. Watch it all the way through – you will not believe it. Anyways, back to the cake. Despite my firm anti-Contessa stance, my friend Nick introduced me to Ina’s chocolate cake and I must admit it is among the best ones I’ve ever had. Dark, dense and not too sweet, with a nice coffee undertone – all in all a very adult dessert. Ina slathers it with her chocolaty butter ball abomination (see above), but I prefer to serve it dusted with a little powdered sugar and accompanied with either a scoop of vanilla ice cream, a scoop of coffee ice cream or whipped cream. I have even been known to include all three when putting on the dog (or le chien, as the Contessa might say) for company. If I do frost this cake, I make vanilla with a touch of cream cheese. 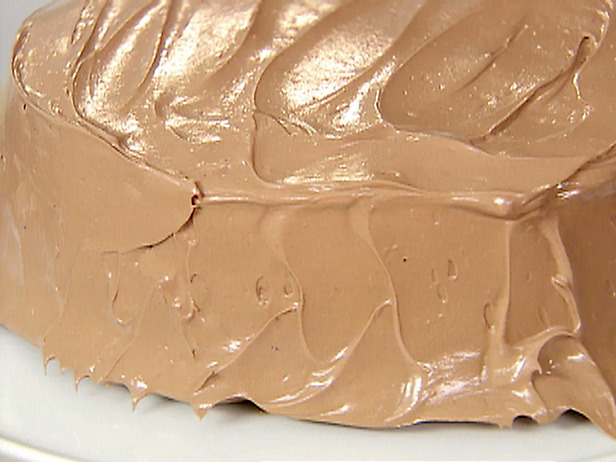 Coffee flavored icing would also be good, but I make it a policy never to frost chocolate cake with chocolate icing. It’s just too much for me, though the Contessa insists it’s divine and many people agree. You’ll do as you like. Anyways, here’s my version of Ina Garten’s “Beatty’s Chocolate Cake” minus all the nagging and fuckery of the original recipe. If you prefer your instructions with all that stuff left in, here’s the link. Preheat the oven to 350. Remember to remove all the Tupperware, skillets and cupcake pans you’ve been storing in there before you crank up the temperature. Sift the following into a bowl and mix it all around to combine. Stir until combined. Make sure there are no dry ingredients or random unmixed blobs lurking in the bottom of the bowl (if you find any, just scrape ‘em up and mix ‘em in) and pour the batter into the pans. Bake for 35 minutes and test for doneness. Now, here’s the thing. I prefer this cake a bit wet, so I take the pans out before the toothpick comes out completely clean when stuck in the center. If you like your cakes more conventionally dry (in other words, cooked through), just leave them in for another five minutes or so and check with the toothpick again. Your call. Leave the cakes in the pans for 30 minutes, then turn them out onto racks to cool completely. Garnish as you wish. Posted on December 31, 2011, in Baking, Dessert, TV Cooks and tagged Barefoot Contessa, Butter, Cake, Chocolate, Drink and Food, Humor/Commentary, Ina Garten. Bookmark the permalink. 3 Comments. Always a delight reading your spin and lighter side of cooking. Cheers to another year! Slimmer but no more sober in 2012!